Oracle Global Support strongly recommends that you use Red Hat Enterprise Linux ES/AS 4 (update 3 or higher). This is kernel 2.6.9-34 or greater. Imp metalink notes to look at before installation: 452780.1. Setup user equivalence between the rac nodes. Check that oracle is able to ssh between the rac servers without having to type the password. 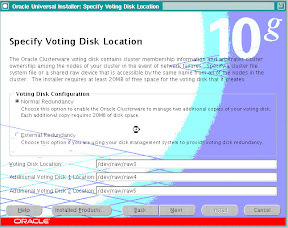 Setup up location of OCR & Voting disk files. For test purposes I used the same mount point with different folders for each e.g. 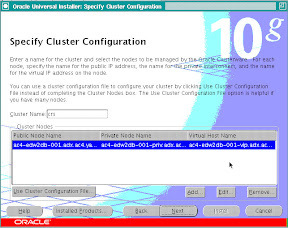 Now run the cluster verify utility to do a pre-check before the cluster installation. Check: Node reachability from node "oradbdev01"
Result: Node reachability check passed from node "oradbdev01". Result: User equivalence check passed for user "oracle". Check: Existence of user "oracle"
Result: User existence check passed for "oracle". Check: Existence of group "oinstall"
Result: Group existence check passed for "oinstall". Result: Membership check for user "oracle" in group "oinstall" [as Primary] failed. 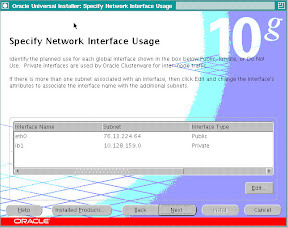 Interface information for node "oradbdev02"
Interface information for node "oradbdev01"
Check: Node connectivity of subnet "10.66.80.0"
Result: Node connectivity check passed for subnet "10.66.80.0" with node(s) oradbdev02,oradbdev01. Check: Node connectivity of subnet "192.168.0.0"
Result: Node connectivity check passed for subnet "192.168.0.0" with node(s) oradbdev02,oradbdev01. Result: Node connectivity check passed. Result: Total memory check passed. Result: Free disk space check passed. Result: Swap space check passed. Result: System architecture check passed. Result: Kernel version check passed. Check: Package existence for "make-3.80"
Result: Package existence check passed for "make-3.80". Check: Package existence for "binutils-2.15.92.0.2"
Result: Package existence check passed for "binutils-2.15.92.0.2". Check: Package existence for "gcc-3.4.5"
Result: Package existence check passed for "gcc-3.4.5". Check: Package existence for "libaio-0.3.105"
Result: Package existence check passed for "libaio-0.3.105". Check: Package existence for "libaio-devel-0.3.105"
Result: Package existence check passed for "libaio-devel-0.3.105". Check: Package existence for "libstdc++-3.4.5"
Result: Package existence check passed for "libstdc++-3.4.5". Check: Package existence for "elfutils-libelf-devel-0.97"
Result: Package existence check passed for "elfutils-libelf-devel-0.97". Check: Package existence for "sysstat-5.0.5"
Result: Package existence check passed for "sysstat-5.0.5". Check: Package existence for "libgcc-3.4.5"
Result: Package existence check passed for "libgcc-3.4.5". Check: Package existence for "libstdc++-devel-3.4.5"
Result: Package existence check passed for "libstdc++-devel-3.4.5". Check: Package existence for "elfutils-libelf-0.97"
Result: Package existence check passed for "elfutils-libelf-0.97". Check: Package existence for "glibc-2.3.4-2.19"
Result: Package existence check failed for "glibc-2.3.4-2.19". Result: Package existence check passed for "glibc-2.3.4-2.19". Check: Package existence for "glibc-common-2.3.4"
Result: Package existence check passed for "glibc-common-2.3.4". Check: Package existence for "glibc-devel-2.3.4"
Result: Package existence check passed for "glibc-devel-2.3.4". Check: Package existence for "gcc-c++-3.4.5"
Result: Package existence check passed for "gcc-c++-3.4.5". Check: Package existence for "compat-libstdc++-33-3.2.3"
Result: Package existence check passed for "compat-libstdc++-33-3.2.3". Result: Group existence check passed for "dba". Check: User existence for "nobody"
Result: User existence check passed for "nobody". The check has failed for me for checking if oracle users primary group is "oinstall". I am using dba as the groups. Hence I am omitting this error. I received this error as I had not setup my environment properly before starting the installation. make: *** No rule to make target `/home/oracle/product/11.1.0/db/rdbms/lib/env_rdbms.mk'. Stop. 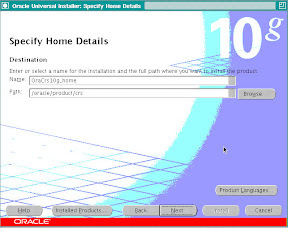 I stopped the installation and setup ORACLE_HOME again and started the install again. Again at this point my $PATH showed wrong path. Hence remove unnecessary entries from $PATH and restarted installation and it worked this time. There were permission problems on the folders in node 2. Resolved the issue and restarted the installation. This shows that crs installation was successful on both the nodes!! 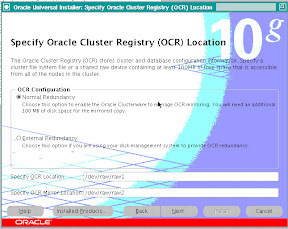 Download oracle crs software from http://www.oracle.com/technology/software/index.html location. For this document we will use oracle 10.2.0.1 crs software. As we are building a 2 node RAC system, we will need to setup user equivalence for oracle user between both the nodes. Its done by generating ssh keys on both the nodes and concatenating then in a file called authorized_keys. The file need to be in $HOME/.ssh directory on all the RAC nodes. Node reachability check passed from node "ac-oracle-001". 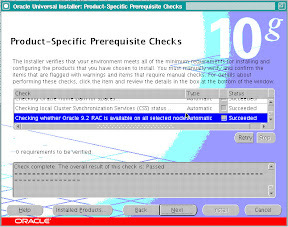 User equivalence check passed for user "oracle". User existence check passed for "oracle". Group existence check failed for "oinstall". Node connectivity check passed for subnet "76.13.224.64" with node(s) ac-oracle-002,ac-oracle-001. 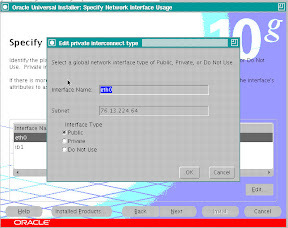 Node connectivity check passed for subnet "10.128.159.0" with node(s) ac-oracle-002,ac-oracle-001. Free disk space check passed. Package existence check passed for "binutils-2.15.92.0.2-13". Group existence check passed for "dba". User existence check passed for "nobody". As I am not using oinstall group, I am going to ignore the error for the oinstall group not existing. This is give you the welcome screen, please press next. This screen shows that the installer is running a check from pre-requisites. I received the above error, this happened as the user equivalence was not setup properly. I rectified the problem and proceeded. This shows the details for the Public and Private IP, Please verify and see if the installer has got the right information about the IP addresses. Next you will see the install summary page, please press INSTALL on this page. After the installation completes you will be asked to run the orainstRoot.sh and root.sh as root user. 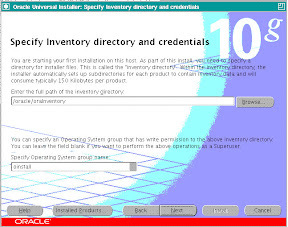 Changing permissions of /oracle/oraInventory to 770. Changing groupname of /oracle/oraInventory to dba. These 2 scripts need to be run on all RAC nodes. These format and initializes the OCR & Voting Disks. After the root.sh has completed successfully, the crs would come up on that node. This completes the 10.2.0.1 CRS Installation. OPatch completed the command 'cd /oracle/product/10.2.0/db/rdbms/lib; /usr/bin/make -f ins_rdbms.mk ioracle ORACLE_HOME=/oracle/product/10.2.0/db || echo REMOTE_MAKE_FAILED::>&2 ' with warnings. No action is required, please ignore the message, it is a internal code bug message reference for developer to fix the code in future versions. Just thought of sharing this info. You may receive this error/warning with a lot of other patches, I faced this for other patches too. successful addition of votedisk /mnt/db_crs_mirror1/vd2. successful addition of votedisk /mnt/db_crs_mirror2/vd3. successful deletion of votedisk /mnt/db_crs/vd2. successful deletion of votedisk /mnt/db_crs/vd3. PS: The permission to the voting disk should be root:dba, while copying and creating voting disk as we are using the root user, the permission will change to root:root, which will give error when starting crs. OCR AND VOTING DISK MOVED!!!! Oracle ASMlib is software provided to ease the configuration of Disk Devices. Install these binaries on all RAC nodes. Note: Please make sure to enter default user and group to own the driver interface. We are using 1 lun of 2GB to create partitions. We will create partitions for OCR, Voting Disk, and other database files. You can also create separate luns for OCR, Voting Disk and DB files. Using default value 1009 à Creating extended partition of the remaing space. Reboot all nodes to read the partition table. Run the command "/etc/init.d/oracleasm scandisks" on all other nodes so that ASM disks will show up on all other nodes. Disk "/dev/mpath/mpath8p3" is marked an ASM disk with the label "DISK3"
Disk "/dev/mpath/mpath8p8" is marked an ASM disk with the label "DISK4"
To find out the exact disk reflected in the output of oracleasm, use the entries in /proc/partitions file. 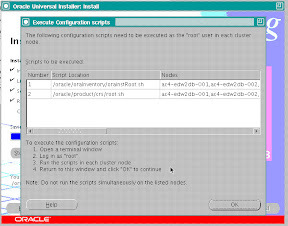 # ORACLEASM_ENABELED: 'true' means to load the driver on boot. # ORACLEASM_UID: Default user owning the /dev/oracleasm mount point. # ORACLEASM_GID: Default group owning the /dev/oracleasm mount point. Make these changes in all the nodes. On Linux platform, the LUNs presented from NAS or SCSI devices are identified with the device name (or path) /dev/sdx (/dev/sda, dev/sdb, etc). A common issue is that the device names (including multipath device name like /dev/mpath/mpath0 if multipath is enabled) can be changed when some disks are removed or added (as planned or due to I/O failures), SCSI or FC is reconfigured (like adding or removing ISCSI channels) or even host is rebooted. Even these devices are bound to raw with the consistent name (like /dev/raw/raw1) and assigned to OCR and voting disks, starting CRS can still fail because of the content of the device is not the OCR or the voting disk. To address this issue, you can use either multipath software or udev utility to setup devices with consistent name for OCR and voting disks. multipath - multipath is a native Linux dynamic multipathing/failover software. An I/O path generally consists of an initiator port, target port, and LUN. Each permutation of this I/O is considered an independent path. Dynamic multipathing/failover tools (software or hardware) aggregate these independent paths into a single logical path. This path virtualization provides I/O load-balancing and non-disruptive failover across the host bus adapters (HBAs) or network interface card (NIC). Multipath software also can assign a consistent device name to LUNs as described in next section. udev - udev is a new feature introduced in Linux 2.6. It provides a dynamic device directory containing only the files for actually present devices. It creates or removes device node files usually located in the /dev directory, or it renames network interfaces. As part of the hotplug subsystem, udev is executed if a kernel device is added or removed from the system. On device creation, udev reads the sysfs directory of the given device to collect device attributes like label, serial number or bus device number. These attributes may be used as keys to determine a unique name for the device. 1. Choose the multipath device which will hold the ocr & voting disk files. Note: Please shutdown all databases and ASM running on the affect nodes, as this will remove all multipath devices. 3. Make these changes to the /etc/sysconfig/rawdevices file, these are for OCR & Voting Disk. 5. Run the following command as root on all nodes so that system automatically binds the devices listed in the rawdevices file when it reboots. 7. For RHEL4, add the following lines in /etc/rc.d/rc.local as root on all nodes so that system will setup the owner, group and permissions properly after reboot. 8. Initialize the OCR and voting disk as root on one node as follow. 10. Now most importantly setting up udev permission. Incase you do not make this changes during CRS installation you will get error. This is a misleading error, and will make us do changes to the actual permission of the devices. I had struggled with this error for a couple of day before I realized that I need to create a file /etc/udev/permissions.d/40-udev.permissions. Also comment out all entries for these devices in /etc/udev/permissions.d/50-udev.permissions file. The OS & oracle needs to refer to only /etc/udev/permissions.d/40-udev.permissions file. Make these changes on all the RAC servers. And reboot all the nodes. This should complete all steps prior to starting any installation. Now you can download oracle crs and database software and start installation.